In this boat tour, the sightseeing boat sets off the Namerikawa port – one of the largest fishing port in Toyama - before dawn to off-shore fixed net fishing ground. There, visitors will have exclusive experience not only viewing mysteriously glowing sea surface and light of firefly squids but also observing how fishermen actually work. Spring on the Tateyama-Kurobe Alpine Route means the world famous “snow wall”! When the snowfall around the Murodo terminal is cleared away, it’s then used to make “snow walls.” Once they are connected together these walls form a “snow valley” longer than 500m. The walls form snow banks that collect even more snow, and can reach 20m in height! The “Snow Wall Walk” opens one side of the road up to pedestrian access, and is a popular spot visited by large numbers of tourists every year. 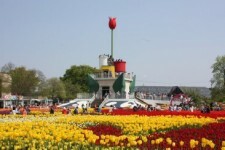 The Tonami Tulip Fair is a world apart, caressed by a refreshing breeze, under a blue sky, surrounded by vibrantly colored flowers. 600 varieties of tulip, the most anywhere in Japan, blossom in an explosion of color comprising more than 2.5 million flowers! There’s plenty of fun to be had every day during the fair, including a variety of smaller events such as a flower fashion show! Daikon-jima is known for peonies and ginsen. The cultivation of those plants has been active since Edo period. Peony Festival is held every spring to celebrate the arrival of the peony season. The highlight of the festival is when over 350 peonies are gathered together for a competitive exhibition and it is a spectacular scene. Yonago City is filled with around 3,000 flowering azaleas every spring, running for 4km from east to west. A variety of events are held during the festival, including short-walks to enjoy the full blooming flowers, handing-out of seedlings, and local entertainment (Yonago Gaina Daiko drumming etc.). The Takaoka Mikurumayama Festival is the perfect way to reaffirm how wonderful Takayama and its long standing traditions truly are. The beginnings of the festival are said to lie with Hideyoshi Toyotomi, an important historical feudal lord. In 1588, Toyotomi welcomed the Emperor Go-Yozei to his palace in Kyoto using seven lavish court carriages. Toyotomi then gave these to his friend, Toshiie Maeda. When his son, Toshinaga Maeda, built Takaoka Castle in 1609, he then gave the carriages to the people, starting the festival. 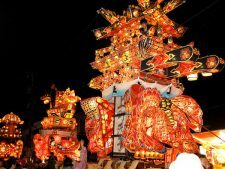 14m-high giant lantern floats are paraded through the streets amidst boisterous cheers of encouragement shouted by men, "Yoi-yasa, yoi-yasa", and boosts up an excited atmosphere of the festival. The late-night jostling at around 11 pm on the 2nd festival day has to be seen. Young men crash and break the opponent's lantern float with the fierce sound of the wooden clappers. San'in region including Yasugi City had once flourished with iron and steel making industry. This ancient method of iron/steel making is called "Tatara" in Japanese. With this history, Yasugi City, also known as the "City of Steel", holds "Yasugi Cutlery Festval" annually. Visitors can learn the history of "Tatara". Cutlery craftsmen from all over Japan participate in the event as well and display their products for sale. Come and enjoy the event! You will find one and only cutlery which is just perfect for you! An event themed around the herring, a fish that heralds the arrival of spring. 1000 of the fish are given away for free, the lighthouse is open to the public, seafood is sold direct, and fresh stocks of herring are released into the ocean. The market opens once a month from May to September. Local fishermen themselves sell fresh seasonal fish they catch at reasonal prices. Seasonal vegetables or inexpensive light meal with local products are also sold at the market. Please enjoy the lively atmosphere of a fishing village.